Our Community is a very tight knit and dedicated community from all over the area. Many of our congregants have roots in Amsterdam, but have since moved to a near by city. Fortunately, they still find Congregation Sons of Israel as their home. Below is a link to found out more about our dedicated members. 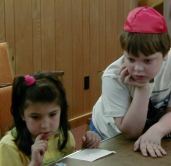 One of the unique aspects of our synagogue is that each year we bring in a student rabbi from the Jewish Theological Seminary. On this page you can find information about our past student rabbis and our current clergy. This website was made possible by a generous donation by Lori (z”l) and Leo Koppel.